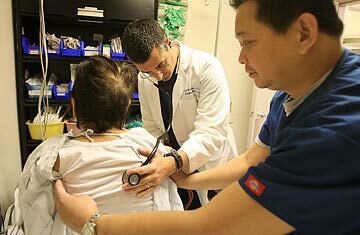 Dr. Jason Greenspan, center, and ER nurse Junizar Manansala care for a patient in the ER of Mission Community Hospital in Panorama City, Calif.
To get a sense of just how dysfunctional American health care is, members of Congress don't need to look further than their local emergency department (ED). The overcrowding in EDs is so bad these days that patients who walk in with "immediate" needs, meaning the most severe on a clinical scale, wait an average of 28 minutes to see a doctor, according to a Government Accountability Office report released in May. That's 27 minutes more than the recommended wait time for such conditions. Between 1996 and 2006, even as some 200 EDs shut down completely, visits nationwide increased from 90 million to 119 million, according to the Centers for Disease Control and Prevention. EDs are so packed that an ambulance is turned away and sent to one farther away every minute. If those daunting stats aren't enough to get lawmakers thinking about EDs in the context of the debate over health-care reform, two others certainly are: after the state of Massachusetts mandated health insurance for all its citizens, visits to already overcrowded EDs jumped 7% in two years, and ED costs increased 17%, according to data obtained by the Boston Globe. In other words, if any health-reform package expands insurance to cover some or all of the nearly 50 million Americans without it now, EDs are likely to be one of the first places to feel the impact. And given one of the ways the Obama Administration is considering to help pay for an overhaul that could cost north of $1 trillion, that impact could be even tougher than expected. A recent proposal by the White House would cut some $216 billion in Medicaid and Medicare funding, including $106 billion that now goes directly to hospitals. Many people have long assumed that health-care reform would be a cure for overburdened EDs. But while a growing number of uninsured Americans are getting medical care that way, they are not the major reason EDs are becoming standing-room only; uninsured patients make up less than 20% of ED populations, and the number of uninsured ED patients is growing at a slower rate than that of patients with private or public insurance. Instead, the culprits of ED overcrowding are many of the same ones contributing to the entire health system's woes. Among them: insured patients who come to the ED because they can't get in to see or don't have a primary-care physician; very sick patients who end up being "boarded" in EDs for days because of a shortage of open hospital beds; and a fee-for-service health-care system that encourages hospitals to invest not in EDs, which are often money losers, but in high-margin procedures like elective in-patient surgery. "You want to take care of everyone who needs it, but it's becoming increasingly difficult financially," says Rich Umbdenstock, president and CEO of the American Hospital Association, one of several interest groups beginning to draw battle lines as the details of potential health-reform legislation begin to trickle out. The recent history in Massachusetts makes it clear that covering the uninsured cannot happen in a vacuum. In fact, more people with access to health care will be a burden on the system, including EDs, without other reforms that address problems like not having enough primary-care physicians. Senator Max Baucus, chair of the Senate Finance Committee, which is taking the lead role in writing health-care legislation, recently told the American Academy of Family Physicians that "meaningful, comprehensive reform must increase the value placed on primary care and redefine the role that primary care provides in our health system." And in a June 15 speech to the American Medical Association, President Obama said he supports government-funded financial incentives to encourage medical students to enter general practice. But it costs money to make that kind of investment, and the cuts the President has proposed include a $106 billion gradual reduction in the payments that hospitals receive for treating high numbers of low-income and uninsured people. The Administration says that as more people get good health-insurance coverage, hospitals will need less of these hardship payments. This makes sense in theory, even to the AHA, but any candid hospital executive will readily admit that facilities use such payments to make up for financial shortfalls in lots of places, most notably EDs. Says Umbdenstock: "Without these extra payments, it would be hard to maintain services that are important but don't turn a profit." Brent Asplin, chair of the Department of Emergency Medicine at the Mayo Clinic, says health-care reform, if it's done comprehensively, can harness the financial value of EDs: "We're the last stop before the hospital bed  the last opportunity to connect people back to a primary-care provider," where regular monitoring costs less than an expensive hospital stay for a more serious condition. "I can spend tens of thousands of dollars on an ICU bed [for a stroke patient], and nobody questions it, but if I try to get them an office visit and routine blood-pressure medication, it's a much bigger challenge." Whether insured or uninsured people are crowding in, an overreliance on EDs means that less preventive medicine and less chronic-disease management is happening, which is part of the reason prevention is a central tenet of the current health-care-reform discussion. In other words, if the ED is the last, and sometimes only, resort for very sick people, then the health-care system as a whole is still very ill. "We can't hospitalize our way to human health," says Asplin. "One of the tragedies of the uninsured is that when they get to us, sometimes all we can do is admit them to the hospital."